A pig that doesn’t fly is just a pig. So says the eponymous Porco Rosso. I have suggested elsewhere (Pallant, 2012) the need to recognise the tension that underpins animated performance, whereby actorly and animatorly performance occupy two extremes of the same continuum. I originally offered this assessment with provocation in mind, given the largely ‘trad’ film studies remit of the journal I was aiming for. In animation circles, however, I feel this continuum conceit becomes a little more problematic, for it could be taken to imply that while all animators are equal, some are more equal than others (i.e. some animators are better equipped than others to animate performance). Yet, I still find the notion of a performative continuum useful. Why? Because it does not provide a fixed outcome, but rather helps highlight the complex DNA of animated performance. How? 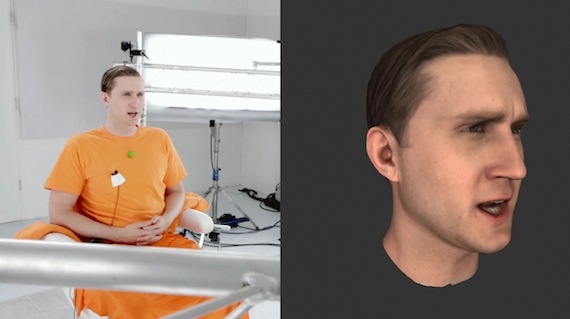 By encouraging a lengthy decision-making process that takes into account a variety of factors beyond who provided the voice and how many cameras did they have in their performance capture rig. Surely it is worth recognising that the animated performance of Cole Phelps, as seen in the video game L.A. Noire (2011), owes a great deal to the real world efforts of Aaron Staton – actorly performance seems a fair description of this variety of animated performance (Fig. 1). Contrastingly, characters such as Wall-E, Gromit, and the metamorphic star of Émile Cohl’s Fantasmagorie (1908) largely develop from an animatorly construction of performance. Having said that, I often find the most interesting or innovative animated performances place me in a state of perpetual indecision, floating on the mid-point of this hypothetical continuum. 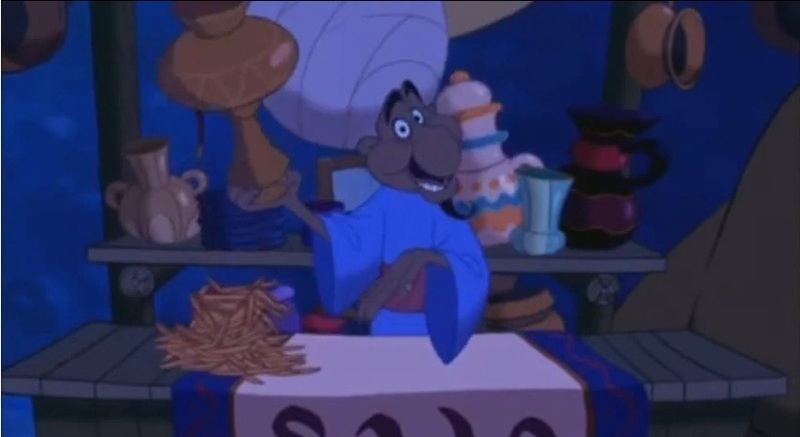 Consider, for example, Disney’s Aladdin (1992); specifically, Robin Williams’ lesser-discussed turn as the merchant who provides the opening narration; even more specifically, his description of a ‘combination hookah and coffee-maker’, which ‘also makes julienne fries’ (Fig. 2). In the original screenplay the narrator simply offers up a ‘cracked jug’ (Clements and Eliot, 1991, 41). Therefore, in this instance Williams’ spoken improvisation preconfigures the key animator’s visual text, yet still leaves room for animatorly performance to be expressed. To approach this slightly differently we could ask who is the author here? Ron Clements and John Musker (the directorial team responsible for the film in question, and who also prompted much of Disney’s more progressive animation during the 1990s)? Debra Armstrong, who was the supervising character animator for the narrator? Armstrong’s team of key animators and inbetweeners? Williams? All of the above could make strong claims over this micro performance, but rather than attempt a definitive attribution, this process of analysis reaps its own reward, in that it highlights the complexities that lie at the heart of animating performance. Rather than provide the reader with an answer to what constitutes animated performance, the aim of this post has been to cast a light upon part of my own interpretational logic in this regard. In this era of pervasive (and often unseen) animation, appreciating what lies behind the animated performance has never before been so challenging and rewarding. Clements, R., & Eliot, T. 1991. Aladdin. London: Hollywood Scripts. Pallant, C. 2011. Demystifying Disney: A History of Disney Feature Animation. New York: Continuum. Pallant, C. 2012. “Digital Dimensions in Actorly Performance: the Aesthetic Potential of Performance Capture,” Film International 10.3, pp. 37-49. Dr Chris Pallant is Senior Lecturer in Film and Digital Media at Canterbury Christ Church University. He is the author of Demystifying Disney: A History of Disney Feature Animation (New York: Continuum, 2011). His research interests include animation, filmmaking production practices and technologies, and video games. He has also published in book chapter and journal form on a range of topics, including Disney feature animation, the ‘cartoonism’ of Quentin Tarantino’s live-action films, performance capture technology, and the work of Rockstar Games. He is currently completing a book on storyboard history with Steven Price for Palgrave and is also in the early stages of putting an edited collection together on the subject of animated landscapes. I offer a lengthier analysis of Williams’ performance, comparing the screenplay with the final film, in Demystifying Disney: A History of Disney Feature Animation (2011), pp. 105 – 110.